Until I heard this Karabits reading, André Previn’s recording of Walton’s First Symphony had always been for me the oner against which others were to be judged. It is well known that Previn was a passionate champion of Walton’s orchestral music. The composer particularly admired Previn’s recording of his First Symphony with the London Symphony Orchestra. Now this Onyx recording can be set beside Previn’s. It probably outshines it in sheer emotional charge and certainly in terms of outstanding recorded sound. It is generally thought that the first three movements of Walton’s First Symphony were a reaction to the troubled relationship he had endured with the highly strung Baroness Imma von Doernberg. Certainly the first three movements are a tempestuous ride. Previn’s reading of Walton’s opening movement spans just a second or two more than Karabits’s, at 13:50 minutes. Karabits realises all the anguish and white heat fury that Previn unleashes, and more. Both conductors allow just a flicker of self-pity to show in the music about half way through. This, though, is quickly extinguished in seething pent-up rage that grows and grows until the tremendous outburst that is the blistering climax of the movement. The second Scherzo movement is marked Presto con malizia; and malicious it certainly is. Previn’s reading makes one’s hair stand on end, and Karabits is every bit as chillingly exciting. The third movement marked Andante con malinconia continues the sourness, delving deeply into the shadows with quivering strings and plangent woodwinds. Self-pity is again held at bay by defiance and remonstrance. The profoundly tender melody at the heart of the movement is ultimately overtaken by material of increasing vehemence. There was a lengthy gap between the composition of these first three movements and the Symphony’s Finale Maestoso - Brioso ed ardentemente. In 1934 William Walton began a new much happier relationship with Alice, Countess Wimborne. The complete symphony was first performed in November 1935, and it was noticeable how much more positive this finale was. It was optimistic, life-affirming, thrusting and in the end heroic. Both Previn and Karabits deliver exciting sweeping performances. Previn is just slightly ahead in commitment and warmth but there is so very little in it. 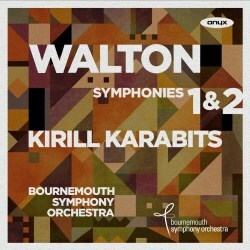 Karabits’s new recording of Walton’s First Symphony can be placed alongside Previn’s much admired recording but Previn’s is outclassed now in terms of this splendid Onyx recorded sound: warm, spacious, with wide perspectives and so full of detail. Walton’s Second Symphony came as something of a disappointment after the tremendous impact of the First Symphony. By 1960 Walton had settled in Ischia, in the Bay of Naples, with Lady Susana. The music of the Second Symphony has a brightness and vividness of colour (if not the overt romance and lyricism of the Violin Concerto) that reflects the brilliance of the Mediterranean light. It is less emotionally raw than the First Symphony but tighter. The opening movement is somewhat enigmatic—sometimes assertive, bombastically so, sometimes restless and mysterious. There is a brooding tenderness too. But it is the central Lento assai movement that captures the ear, and Karabits weaves magic here. There is a plaintive poignancy and an agitated questioning tartness but also a lyrical almost out-of-this-world mood of solace. The symphony’s final movement is a complex Passacaglia taking in a Theme and ten variations, a fugue and a Coda scherzando. The music is powerful and dogmatic with strident, whip-like staccato chords, sardonic in mood. The whole rounds off in jubilation.